Jouha counts ten donkeys, but riding along he realizes that now he has only nine! 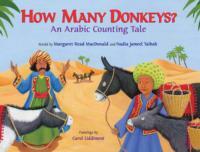 Listeners get to help count…in Arabic…each time Jouha mounts and dismounts to... "Count again, Jouha!" Retelling of a Saudi folktale from co-author Nadiah Taibah’s aunt Salha. Arabic numerals run across bottom of page, along with English pronunciation and Arabic script for numbers. Don’t worry about pronunciation of the Arabic numbers. Your guesstimate will automatically be close. But if you are concerned you can CLICK HERE to hear Nadiah pronounce the Arabic numbers. UAE Bookfair award for Children's Book by non-Arabic author about Arabic topics.